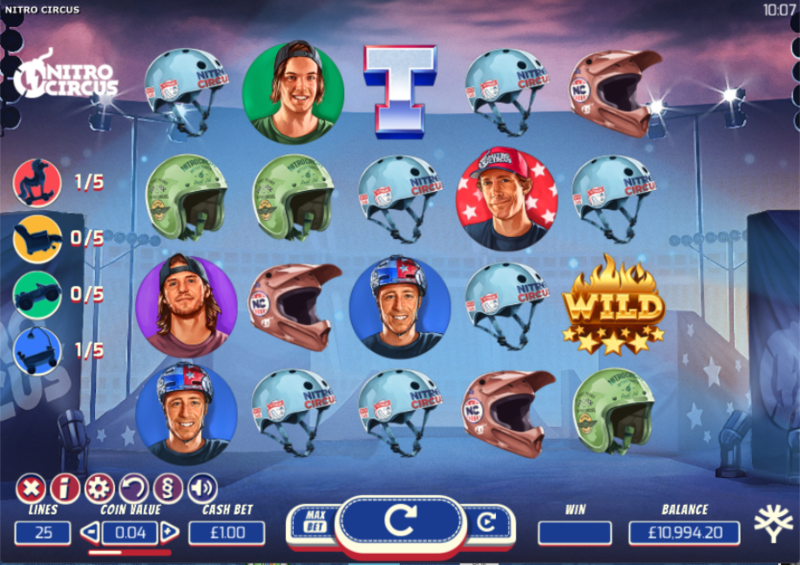 This is a shout out to any online slots fans out there who also appreciate some extreme sports, in this case in the form of the famous Nitro Circus, Travis Pastrana’s group of wild men and women who travel the world showcasing their skills at a number of dangerous pastimes. Yggdrasil Gaming have come up with this game as a tribute to the travelling show. Nitro Circus is a five reel slot with four rows and twenty five fixed paylines; a smoky arena is the backdrop for those reels and you’ll see riders hitting the ramps and performing big tricks in the background. The four high value symbols include Pastrana and three of this fellow athletes while helmets in brown, green and blue make up the lower values. The wild is a fiery, gold ‘Wild’ which will replace all other symbols to help form winning combinations except for the Nitro Bomb and the silver letters. This is triggered by landing the letters ‘N’, ‘I’, ‘T’, ‘R’ and ‘O’ on reels one to five respectively; you’ll now get to pick from the available vehicles and that one will head off on three warm-up jumps to collect coins, multipliers, speed boosts and tokens which enable the extra vehicles to the left of the reels to be unlocked. You’ll now get to perform the main jump to win multiplier values and you can select your speed boost level to start with to earn higher values but at a greater risk of crashing. The vehicles to the left of the reels become usable as their meters fill up and they are capable of faster speeds, higher jumps, etc. Trigger this by landing three, four or five of the Nitro Bombs anywhere in view which will award 10, 20 or 30 free spins respectively. You only need one Nitro Bomb to kick off the Nitro Blast Mini Game here and as well as the items listed above you may also win 1/2/3 extra free spins or increase the multiplier value of any wins by 1x. You’ll start the free spins with a multiplier of 2x. 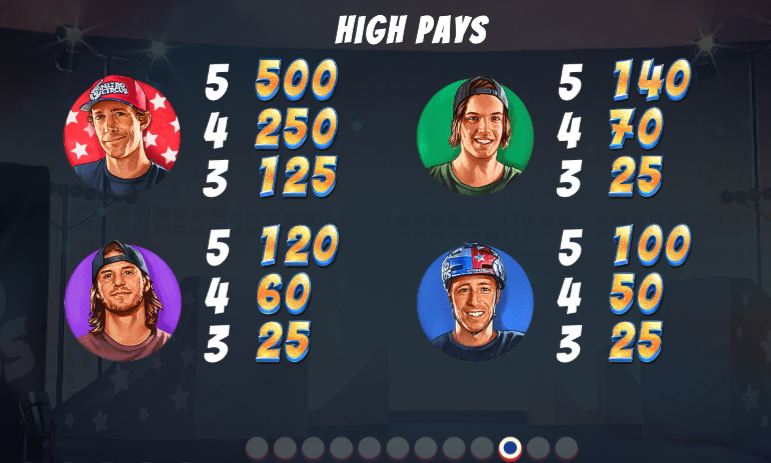 Nitro Circus is a cleverly designed slot which brings plenty of the high octane action of the performers to the reels along with a dramatic rock soundtrack; the bonus features seem within reach and there’s plenty of replay value with the collectible vehicles. To top it off there’s a nice, high RTP of 97.00%.